More enlightened leaders at the Federal Reserve would never have allowed, much less intentionally encouraged, yet the third speculative episode in 15 years. Unfortunately, the idea that repeated cycles of malinvestment and yield-seeking speculation have actually been the cause of the nation’s economic malaise doesn’t seem to cross their minds. They appear more interested in dogma than in data. The dogma is that there is a Phillips Curve between employment and inflation that can be manipulated provided a sufficiently massive distortion of the monetary base and the level of short-term interest rates. The data is that there is a feeble correlation between the Fed’s policy tools and the objects they wish to control. One wonders whether the FOMC has even made the effort to operate a scatterplot to visualize these undependable relationships, or to actually estimate effect sizes to discover how limited their ability is to manipulate the real economy. The strongest line of cause and effect they will discover is their ability to produce repeated financial crises through reckless monetary distortions. 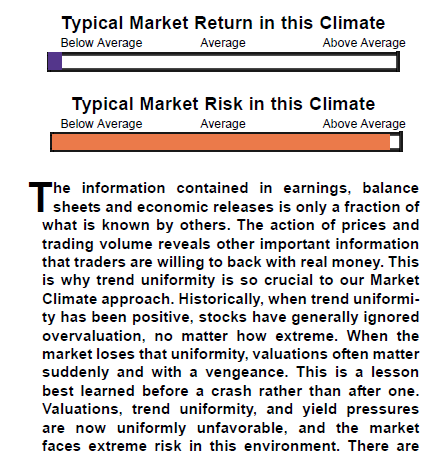 Our pre-2009 methods of classifying market return/risk profiles were based on post-war data, and while our stress-testing efforts widened their scope to include Depression-era data, the resulting methods also picked up another regularity: in prior market cycles across history, the emergence of an extreme syndrome of overvalued, overbought, overbullish conditions had generally been accompanied or closely followed by a breakdown in market internals. As a result, we responded defensively immediately when those syndromes emerged. As it happened, if quantitative easing did anything to make the period since 2009 “different,” it was to disrupt that regularity. Quantitative easing repeatedly and intentionally encouraged yield-seeking speculation by investors, despite overvalued, overbought, overbullish extremes. Since 2009, it has only been when market internals have explicitly deteriorated (for example, in 2011), that the stock market has declined meaningfully. In mid-2014, we imposed the requirement that a hard-defensive investment outlook must be coupled with actual breakdown in market internals or credit spreads as a prerequisite. See A Better Lesson than “This Time is Different” and Hard Won Lessons and The Bird in the Hand for a more complete narrative. We’ve seen various criticisms based on the misconception that the concerns of value investors such as Jeremy Grantham and I rest simplistically on the Shiller P/E. Those criticisms are coupled with ad hominem criticisms that I’ve repeatedly addressed ad nauseum. All of this might carry more weight if better valuation measures than the Shiller P/E did not also have even worse implications for future market returns. Numerous historically reliable measures, based on earnings, revenues, assets, gross value added, and other fundamentals all line up with a similar message. 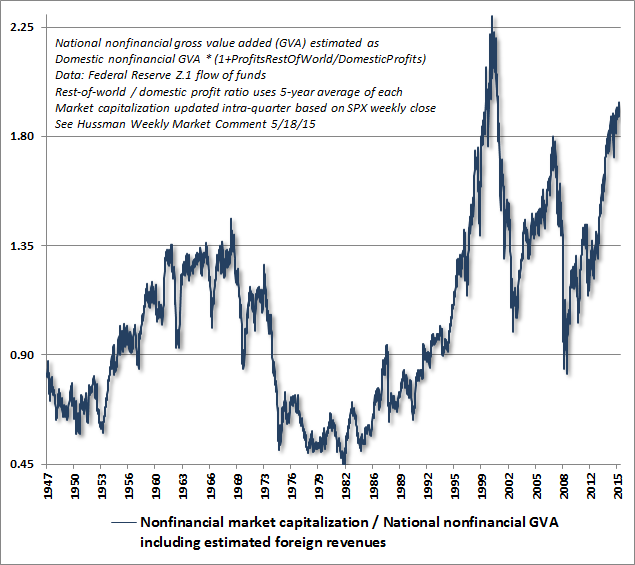 The following chart from Doug Short provides a very nice long-term perspective based on Tobin’s Q (market capitalization / corporate net worth) going back to 1900. August 1937: One of the repeated fallacies of historical perspective currently making its way among analysts is the notion that the Federal Reserve raised interest rates prematurely in 1937, cutting short the recovery from the Great Depression and causing stocks to crash. There are several problems with this narrative. 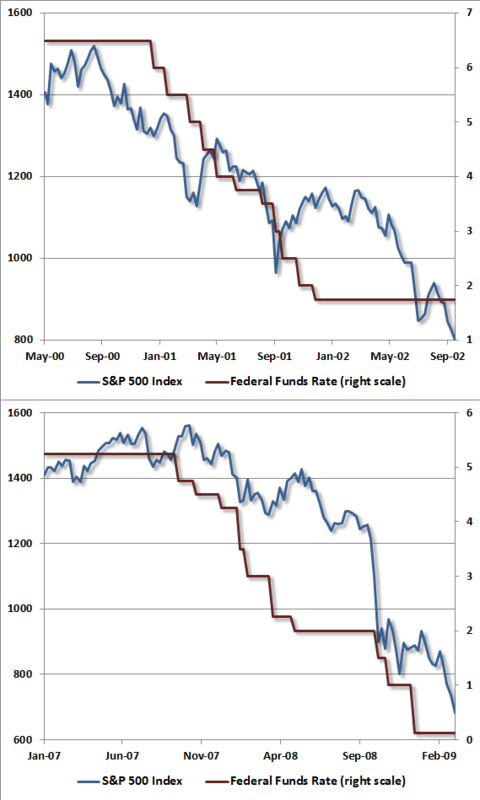 The first is that the Fed did not raise interest rates at all. Indeed, the Fed discount rate was progressively lowered until it reached 1.0% in September 1937, and the first rate hike would not occur until 1948. The Fed did raise reserve requirements in 1936, but at a time when actual reserves were already more than 200% of required reserves. What actually happened in 1937 was that an already fragile financial bubble crashed. Market internals, on our measures, turned negative in May 1937, before the market actually peaked. Following the August high, the stock market went on to lose half of its value by early 1938. In short, a market collapse was already baked in the cake on the basis of extreme valuations, and the subsequent collapse was clearly preceded by a shift toward investor risk aversion. Finally, some additional historical evidence may help to build intuition about what has and has not been effective in market cycles across history. First, understand that “following the Fed” is actually a rather poor trading rule. Periods when one or more yields – Federal funds rate, discount rate, or 3-month T-bill yield – were falling (or steady following a prior cut) do capture a meaningful portion of historical market returns and account for about 67% of history, but that condition alone is also associated with a maximum drawdown of about 55% because it actually provides no risk control at all. Tightening the criteria simply captures less return, with no material reduction in drawdown because of the fact that the Fed was easing persistently in 2000-2002 and 2007-2009. Worse, that rule also misses significant upside because the market has also tended to advance, on average, when interest rate conditions have been unfavorable (the average total return of the S&P 500 isn’t strongly dependent on the Fed’s stance, so the rule rarely favors going to cash). 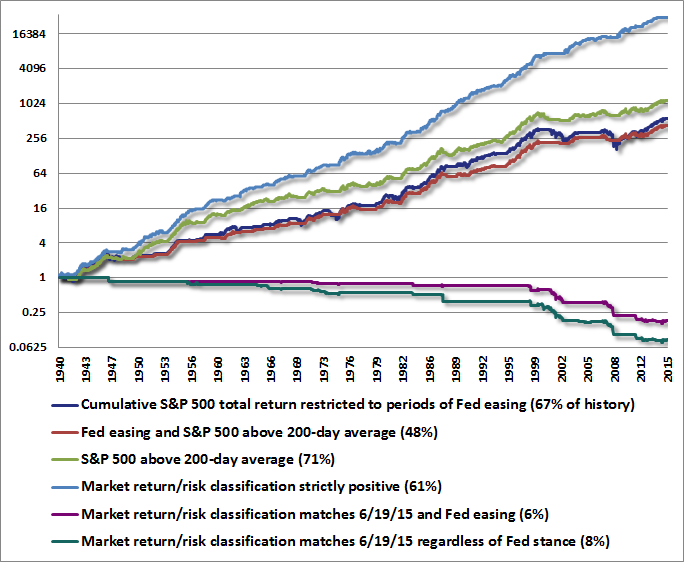 In short, following the Fed doesn’t provide an informative distinction about subsequent market returns. 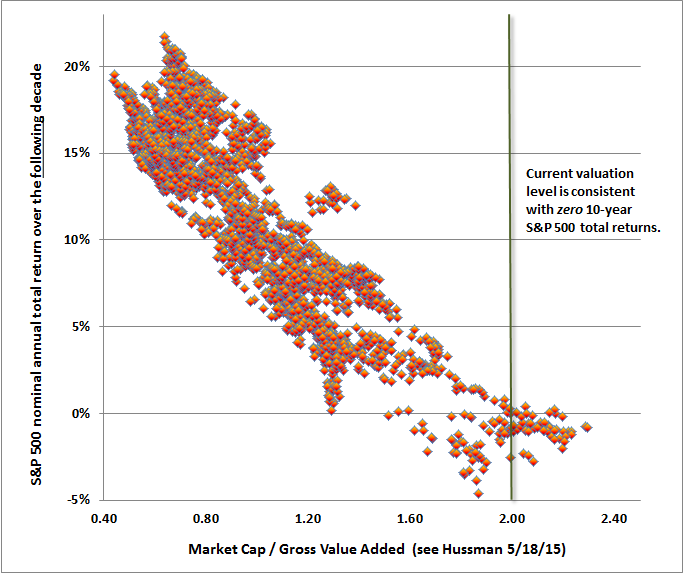 The chart below also partitions S&P 500 returns based on various market return/risk classifications we identify. None of these lines depict a portfolio or investment strategy, but merely reflect the cumulative total return of the S&P 500, restricted to various conditions. There is no assurance that future market outcomes will follow the same regularities. As I’ve frequently noted, I view the most effective approach to be one that combines multiple factors, particularly valuations and measures that reflect the market behavior of numerous individual securities, industries, sectors and security types (including interest and credit-sensitive measures). In mid-2014, we imposed a requirement that a strongly defensive outlook must be validated by deterioration in market internals or credit spreads. Notice that out of the 8% of historical periods that match the current market return/risk classification we identify, three quarters of those periods (6% of history) occurred during periods of Fed easing. The market experienced steep losses anyway.